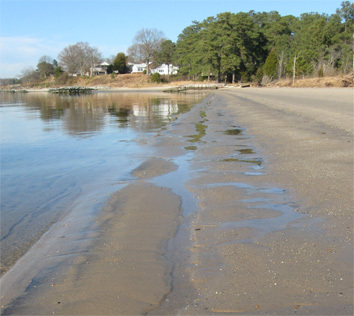 Most of the research in my lab focuses on the biogeochemistry of trace elements in coastal marine and estuarine systems. This includes everything from sources and sinks of metals and their internal cycling, to interactions of metals and biological systems, and emerging metal contaminants. SGD includes flow of fresh groundwater from the land to sea, as well as seawater recirculation through permeable sediments. Chemical fluxes associated with this discharge can support endemic benthic biology, may help drive harmful algal blooms, and can be a major component of chemical budgets in the global ocean. New developments in SGD research are constantly revising our perspective of chemical cycling in the ocean. My lab uses naturally occurring radium isotopes to trace the source and magnitude of SGD in the coastal ocean. We also examine the significance of SGD to coastal metal cycling (including such metals as Mn, Fe, Cu, Pb, Zn, and Mo), and use elemental signatures as SGD tracers (such as stable Pb isotopes). Analogous to surface water estuaries, the underground mixing zone between fresh groundwater and marine porewater is a region of intense biogeochemical cycling. Some work in my lab focuses on biogeochemical processes occuring in the STE, and assesses the role of the STE in regulating SGD-driven chemical fluxes. The STE is also intriguing for its role in formation of metal-rich sedimentary concretions, ecology of micro- and macro-benthos, and influence on chemical budgets in the paleo-ocean. 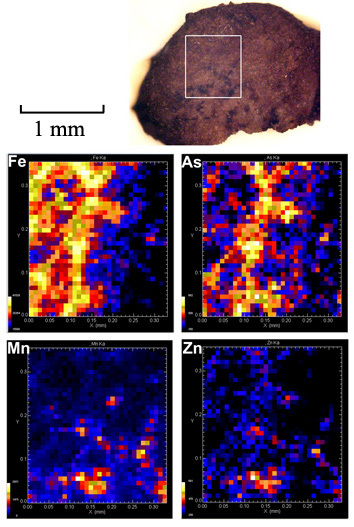 The image at left shows a high-resolution x-ray fluorescence map of a single sand grain from the STE (in collaboration with O. Doherty, SBU-SoMAS). Microbially-cycled Fe- and Mn-oxides control the distribution of other elements such as arsenic and zinc. Microorganisms such as bacteria and single-celled algae exert enormous direct and indirect influence on metal cycling in natural waters. Ongoing work in my lab examines the influence of microalgal biofilms on dissolved metal cycles in aquatic systems. We also study microbial metal cycling in sands and marsh sediments.